Shelf Actualization: Is Murakami a Letdown? Oh Murakami . . .
His novel, 1Q84, was the most hyped literary release of the year (its English translation, that is). I mean, a huge deal. The novel was published in Japan two years ago, and finally hit the shelves in the US in April. So, how critically acclaimed has the novel been? Well, not very . . .
A year or two ago, I agreed to read a Murakami novel with some friends of mine. We decided upon A Wild Sheep Chase. And, as I read these reviews for 1Q84, I felt like I had already read a Murakami novel that is so amorphous and bizarre, with hints of great writing and sensible characters, that I don't need another Murakami experience. My friends, on the other hand, loved A Wild Sheep Chase. But for me, it was too hard to tie down. As we discussed the novel back then, we decided that the randomness of the novel can be attributed to Japanese culture (which none of us claim to understand). But I'm just not sure. 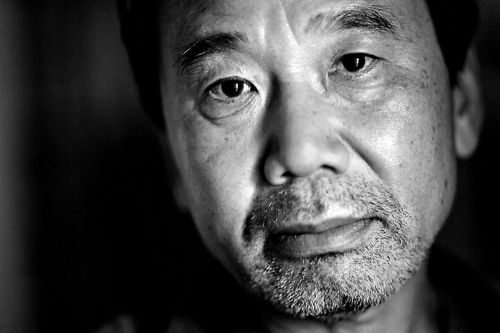 That is my opinion on Murakami: I'm just not sure. And it sounds like 1Q84 is more of the same? My foray into Murakami consists of just two short stories: "The Little Green Monster," which I didn't like, and another than must have been so unremarkable that I don't remember anything about it just a month or two later. I'm not ready to make any sweeping pronouncements about him just yet, but you can enter my experience into evidence if you wish.